On December 2 elections to the Duma, the lower house of the Russian parliament, will take place. When president Putin came to power, relations between the Duma and the president became cordial, especially after the elections of December 2003, which brought absolute majority to United Russia, the party supporting president Putin. The main intrigue of this year's elections is how much support will United Russia get this time and which candidate for presidency will United Russia support in March 2008. The second question is just how successful will Just Russia, a new center-left party, be. Now the superiority of the United Russia seems to be undisputable. According to the Russia's most respected sociological think tank, VTsIOM, United Russia is supported by 47.4 percent of the voters. Its main competitors, communists and Just Russia, can hope to get, respectively, 14.9 and 11.7 percent. The traditional center-right liberal parties, the Union of Right Forces (SPS) and Yabloko, would get 4.4 and 2.7 percent, which would make them non-eligible for representation in the parliament. 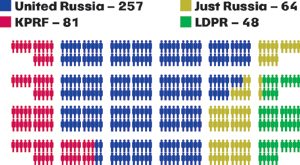 In order to form its faction in the Duma, a party must clear the 7 percent minimum. For the liberal parties, not getting into the Duma could mean political death, as it would be the second electoral defeat in a row. This situation raises the issue of political representation for liberal voters. In the future this gap can be filled by Grazhdanskaya Sila (The Civic Force). This party's program is analogous to the one of SPS. But United Russia may become a victim of its own success. Reports about its superiority may cool down the enthusiasm of its supporters. Meanwhile, the communists are more disciplined, coming to vote under any circumstances. The voters of Just Russia can also be mobilized by influential regional political and business groups opposed to the ruling governors. A region voting for Just Russia can be seen as expressing the citizen's dissatisfaction with the ruling governor.